Last post, I discussed my fantasy to move into a bigger better home, which unfortunately is simply not feasible at the moment. Finances are tight especially of late and with so many things to be fixed and purchased around the house, not to mention insurance renewals and bills; my fantasy move has to be put on hold for a while. Meanwhile, there are plenty of other, cheaper things I can add to my home to make it more beautiful and comfy. 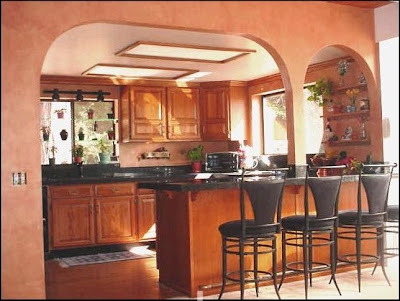 Have you heard of drywall arch? I think this is a fantastic D-I-Y idea, one you can easily do with professional results! After reading about it, even I am convinced about pulling off this mini renovation on my own! With 4 easy steps, you can now add more class and style to your home. Starting at $54.95 per opening, start by choosing from 4 architectural styles of pre-formed corner inserts available at Creative Corners. These pre-formed inserts will transform any ordinary square doorway into a beautiful arched doorway without framing or drywall. All you have to do is Attach Insert, Apply Tape and Compound, Sand, Paint or Wallpaper and voilà - you now have new beautiful interior arches just like that! Have a terrific weekend everybody, thanks for reading and check out the before and after pictures before leaving! 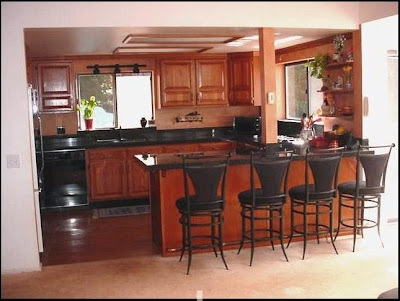 Love the kitchen GP... cantiknya... i want a kitchen like that!! Did i get the chop?? :* :* :* :* Yay Bill FC1! And first chop this month woot! =-O =-O =-O =-O =-O =-O Morning GG! Recent blog:=- Shark Straps Anyone? can't tagay tonight! hav to prctice swimming! U can swim or not GG? Wah practice swimming tonight, have fun sweetie! Wahhhhhhh 4 long years… ok ok hang in there GG, sure will pass with flying colours, hugs! Morning Mon, u just woke up? yeah i just woke up!! u haven't zzzz kah? Ho ho ho still up and about la me! I haven zzzz cause yest slept early remember then woke up early? I am dropping now Mon! Just finished dropping for meows, now dropping for MPG wooo hooo!! He he! So now fresh and wide awake…sure won sleep now..
no i mean around ss2 or damansara, no udang penyet! He he hungry hippo la me now Elai!! Wah Monica dropping early today yay! Can drop together-gether ha ha! Still sleepy?? How many hours u slept and why woke up so early today? hahahah yeah we drop together-gether today!!! i slept for 6 hours only :( coz R lah asked me go makan with him!!!! me too having coffee now!! U still at work Elai? When do u start ur maternity leave? LOL ok la 6 hours, after finish dropping then can take cat nap…can borrow Benji to hug..if u dare la ha ha ha! We are dropping now Elai! :) I edi dropped at ur blog yay! thanks, am dropping now too! don't know when i can drop again... usb modem at the house is soooooo slow! LOL! Enjoy the pics Elai, do u guys have something like dat at ur side? I dropped MD and MPG at ur blog edi Elai, will drop WOAFS after dis.. I mean the chilli is very spicy but some restaurants not so spicy I guess… this one here, fuyooooooo so spicy! Anyway I’m having it tonight for dinner lol!